Below is the list of tools we bring Dr. Bike session. There is even a hot flask of coffee if your early and it not all finished. Workstand and pipe lagging or old tube to protect bikes. Track pump - one with a gauge and multiple valve adaptors. Screwdrivers - large, small and tiny slot and cross head. Allen keys from 8 to 2mm. Spanners from 15 to 6mm. Adjustable spanners large and small. Pliers, needle nose and square. Headset spanners, 28 and 32mm. Cordless soldering iron and solder. Multimeter. You might meet a dodgy dynamo. Bottom bracket and freewheel tools. A handful of cable end caps. A pair of cone spanners. Parallel pliers and mole grips. 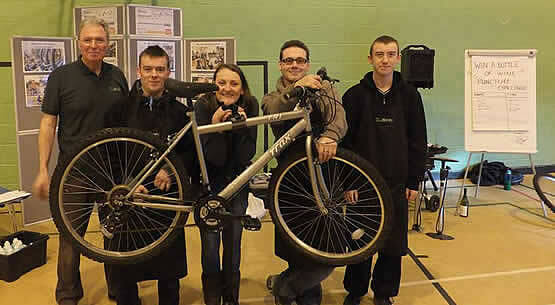 Doctor Bike is a classic travelling medicine event. However the difference is the focus on bikes. 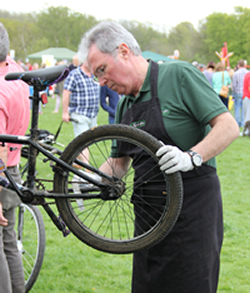 Bikes Revived travells to different locations in Surrey and sets up for 2-3 hrs (demand dependent) - fixes bikes. If your bike needs a tune up look at the shedule below and come and see us. - Pump them up to their recommended pressure. Most bikes haven't had their tyres that hard since they were bought. Owners will be amazed at how fast, easy and un-mushy their bikes feel, and will grin like children in a sweetshop. - Brake blocks missing the rim or hitting the tyre or toed-out and screeching or loose or missing. You know what to do. - Lube is an alien idea to Joe Punter. A can of 3-in-1 does the trick. All of a sudden, rough gears shift nicely again. A miracle cure! - A little WD40 in the parallelogram pivots and some cable tension adjustment, and some total disasters can be made to run sweetly again. In some cases, though, the transmission is so worn that it'll never shift right: don't waste time trying to adjust these, send 'em to the shop. - So apply spoke key. Remember, you can get a wheel true enough in a couple of minutes, its that perfect raceday true that takes ages. You don't need that here. - A generous salad of Allen keys, spanners and screwdrivers sorts this lot out. When the rattles are gone, smiley people emerge. - Cables rusted into their outers are a shop job if a squirt of WD40 and some wiggling can't free them; perished tyres are likewise. If a tyre is particularly iffy, don't inflate it to full pressure. Dr. Bike started off back in the mists of time, probably in one of the big metropliian cities with a H3 bike culture. When bike shop mechanics realised that many riders were in many cases riding utter sheds, often skip-salvaged and dangerous. These mechanics would take along a toolkit and offer to check over the bikes which were present, to make sure that they were safe. The theme took root, and now Dr. Bike can be seen at many venues especially large green events or mass bike rides. That's probably the history. The good Doctor's true origins are shrouded in mystery. The wine on offer is not always available, sometimes its beer ! !